Here is photographic evidence that birds sneeze. 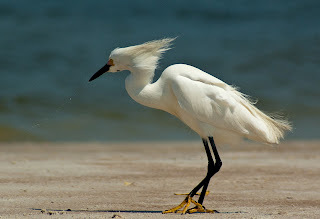 This snowy egret was hunting along the banks of the Ponce Inlet in New Smyrna Beach and apparently got water up the nose, or beak I suppose. I've never seen this and captured the evidence by pure luck and the 5 frames per second on the digital camera. If you click on the image and get the larger view it's much more noticeable.